Next regular update is Saturday, December 1st. November 23, 2018 - The article below appeared five years ago on the November 22, 2013 Home page. It is being re-posted this week because the historical significance of its content. November 22, 2013 - The shocking events of fifty years ago today, and the days that followed, are snapshot moments indelibly etched into the memories of all Americans who were old enough at the time to comprehend the gravity of what had happened. Over the years that observation has become almost a cliché, but it's true! 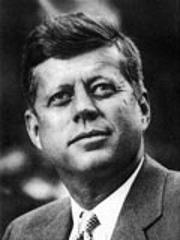 The assassination of President John F. Kennedy on Friday afternoon, November 22, 1963 was for the young people of the "Baby Boom Generation" what December 7th had been for the young people of 1941, who would become the "Greatest Generation," and what 9/11 has become for our children and grandchildren. And like those awful events of 1941 and 2001, the events of that terrible Friday afternoon one-half century ago changed the course of world history. Fifty years ago this week, Dep. Chief Everett Doherty's 2nd Platoon was working the day shift from Tuesday the 19th through the Friday the 22nd. 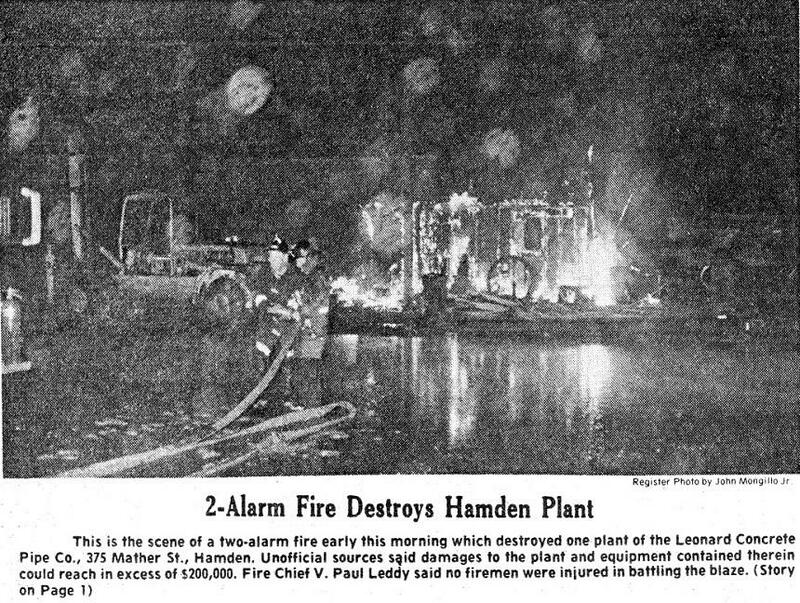 During that four-day trick, an unidentified New Haven Register reporter visited Hamden Fire Headquarters to write a story about the daily routine of Hamden firefighters. 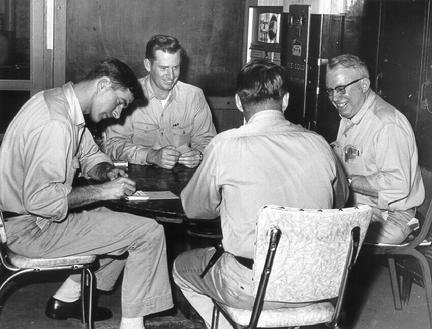 The reporter returned the following week to include three recruit firefighters who started on the job the day after President Kennedy's funeral. The story was published on Sunday, December 1st. 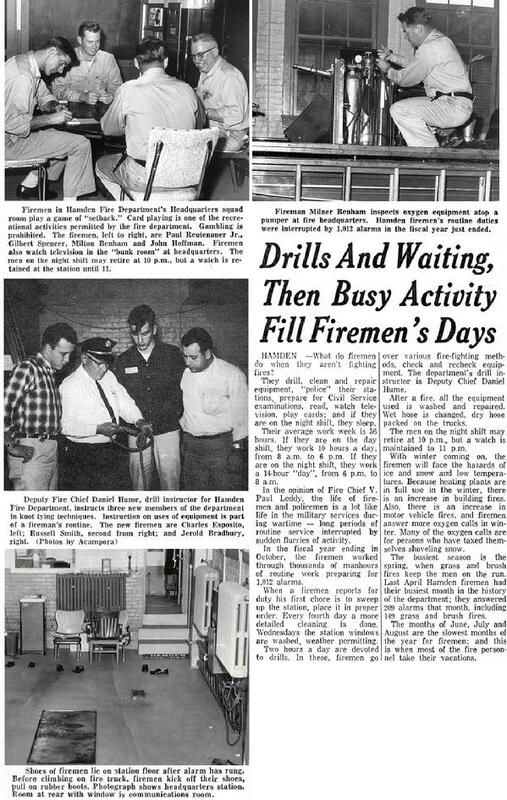 When the three recruit firefighters pictured in center-left photo of this article came on the job, the workweek was 56 hours and the pay was under $100 a week. Two of the new firefighters stayed about two years. The third recruit, Charles Esposito, stayed for 30 years. In 1989, Lieutenant/Paramedic Charlie Esposito was appointed as the Department's second EMS Officer. Contrary to the photo credit in the newspaper article, all but one of the photos in the article were taken by veteran newspaper photographer D.F. Vaccaro. The center photo of Dep. Chief Hume training the three recruit firefighters was taken the following week by someone identified as Acampora, possibly the reporter. 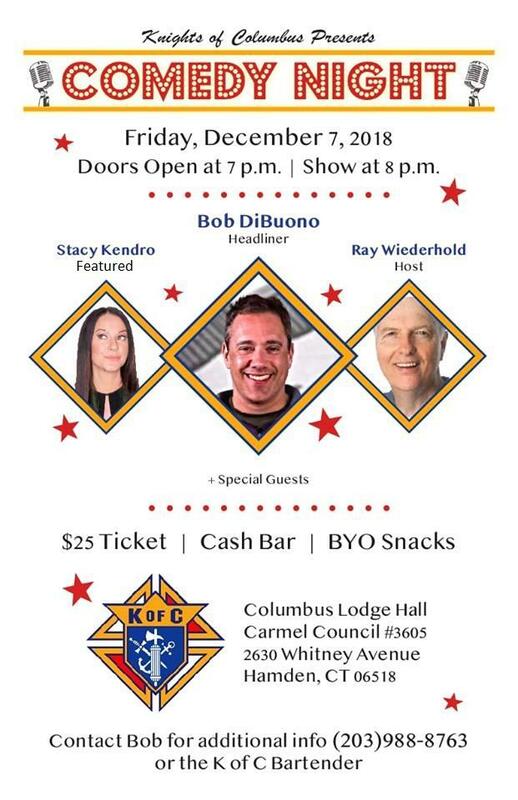 The Vaccaro photos are believed to have been taken on either November 19th or 20th, and the Acampora photo on November 26th. The website does have some of the original glossies from that newspaper article, all by D.F. Vaccaro. The two Vaccaro photos immediately below did not appear in the published article - the three photos below them did. Ben Mikolinski and another day shift firefighter demonstrated the art of bed making for the benefit of the reporter. In some departments the day shift made the beds for the night shift. 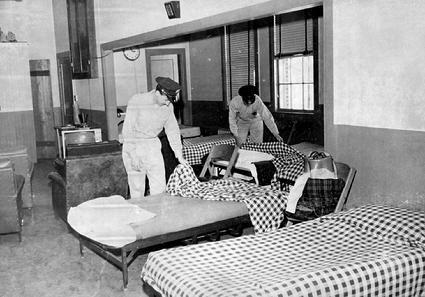 But in Hamden the night shift always made their own beds before going home each morning. 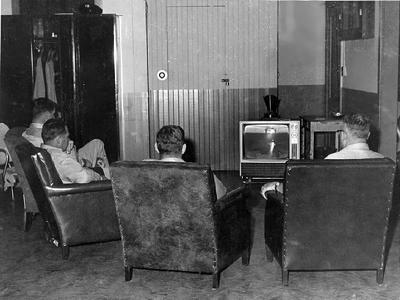 Once the chores and training were done, (L-R) Firefighters Paul Reutenauer, Milner Benham, Gil Spencer and John Hoffman demonstrated the art of television viewing. We used to call this "alarm readiness." These days there is a lot more "alarm" and a lot less "readiness." Dep. Chief Dan Hume with recruit firefighters Jerold Bradbury, Russell Smith and Charlie Esposito, who started on the job Tuesday, November 26th, the day after the National Day of Mourning for President Kennedy's funeral. Charlie Esposito put in 30 years and retired as the department's Emergency Medical Services Officer in 1993. 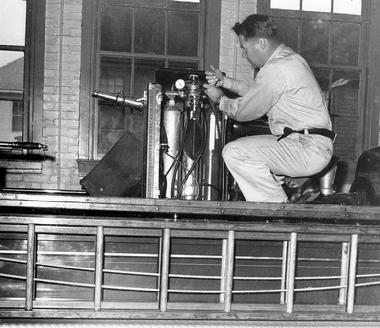 Firefighter Milner Benham atop Engine 4, the 1954 Maxim, inspecting the E&J resuscitator. 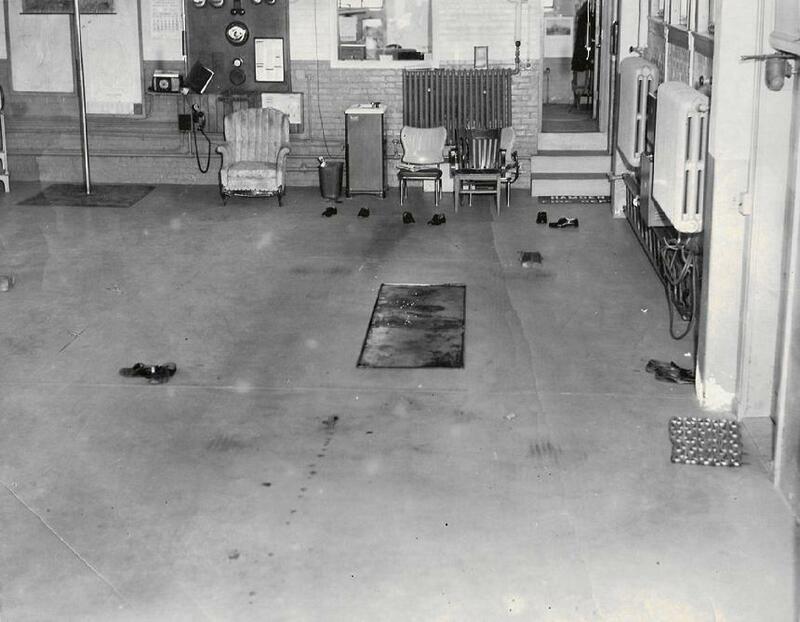 Note the officer's shoes front left, and the driver's shoe's front right, and the three pairs of shoes at the rear. Three firefighters rode the tailboard, making it a crew of five! With the upcoming certification of the department's first 17 Emergency Medical Technicians, the department purchased a brand new rescue truck on a 1971 Ford chassis and modular body, with far greater capabilities than the units that preceded it. 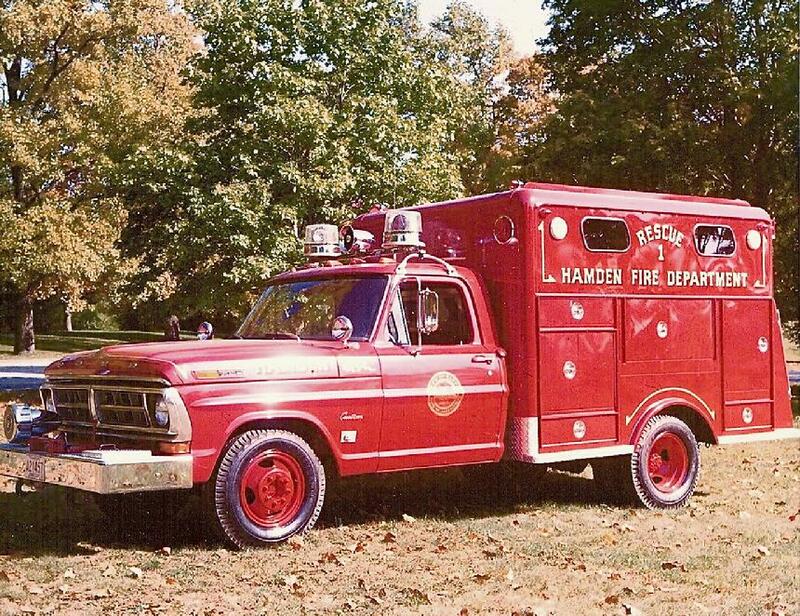 The $15,473 truck was placed in service at Fire Headquarters (Station 4) the week of November 22, 1971. 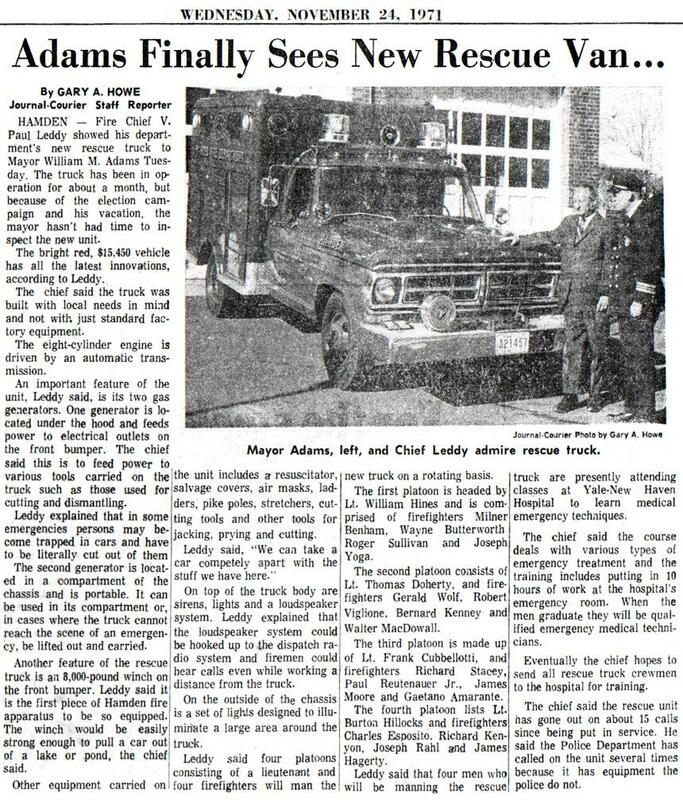 In the newspaper article below, Chief V. Paul Leddy is shown conducting an inspection of the new rescue for Hamden Mayor William Adams. With the acquisition of the new Rescue 1, the town opened bids from various potential buyers to purchase the three original "rescue units" on the morning of November 23, 1971. The first was the original 1938 Diamond-T "Emergency Squad" which ran out of Station 4 until the late 1950s. 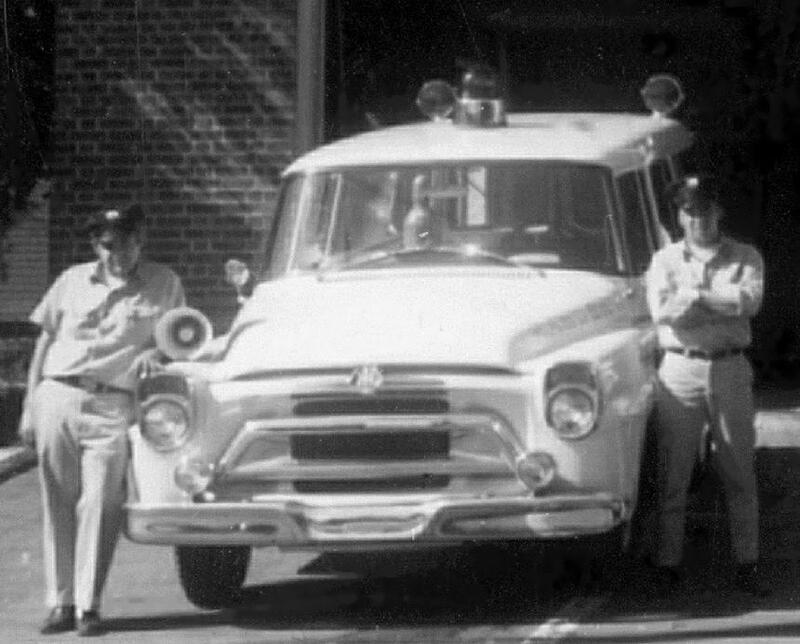 The other two units were the almost identical 1958 and 1960 white International Travelall Suburban-like panel trucks that had served as Rescue 1 and Rescue 2. 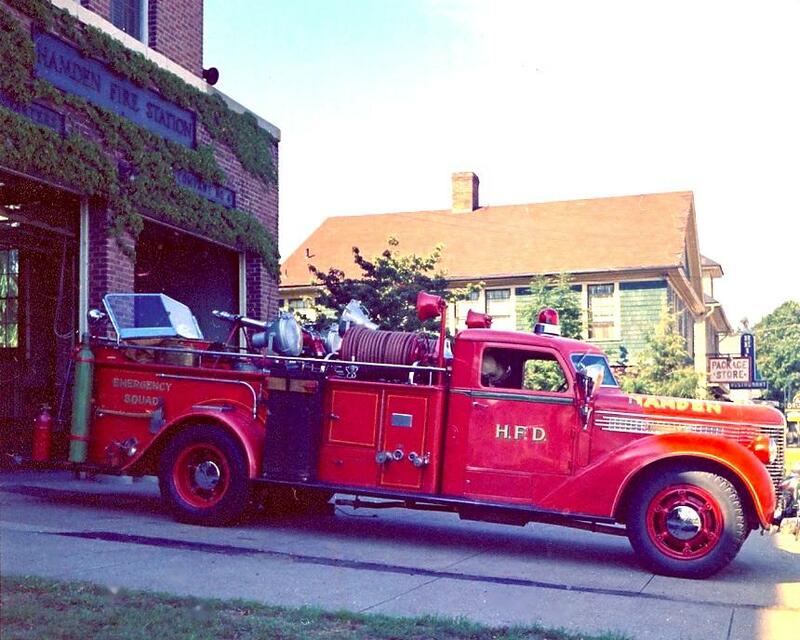 1938 Diamond-T "Emergency Squad" served at HQ until 1959, when it became volunteer Engine 9, then a spare. Bids for all three vehicles were opened on the morning of Tuesday, November 23, 1971, in the auditorium at Hamden's Memorial Town Hall. The second highest bidder for the 1938 Diamond-T, at $266, was the Mt. Carmel Volunteer Fire Co. The volunteers were hoping to obtain the truck as a "parade piece," to be preserved as an example of one of the department''s earliest closed-cab apparatus. A private party, whose envelope was opened last, outbid the volunteers by a mere six bucks. The 1938 Diamond-T was seen at local fire musters as recently as the early 1980s, but its present status is unknown. 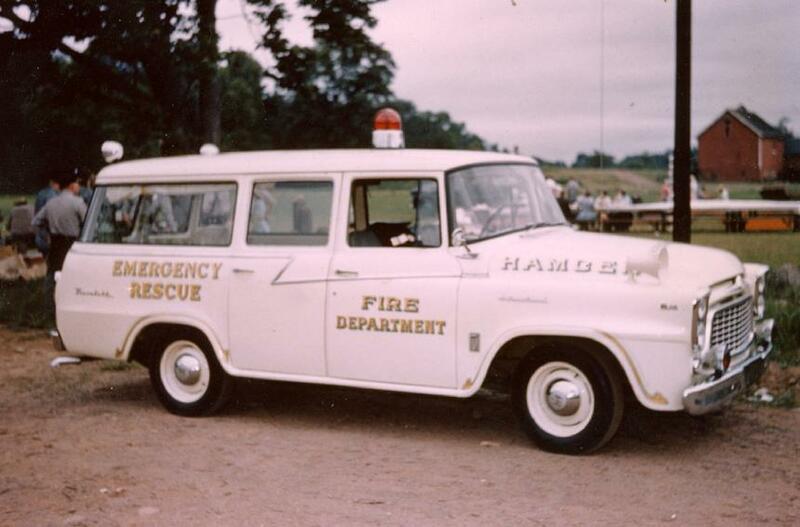 Rescue 1, the 1958 International Travelall (department records confirm that it was a 1958 model). Rescue 1, the 1958 International Travelall, ran out of Station 2 from December 10, 1958 until 1961, when it was reassigned to Station 3 on Putnam Avenue. It was assigned briefly to new Station 3 from September 1970 until November 1971. 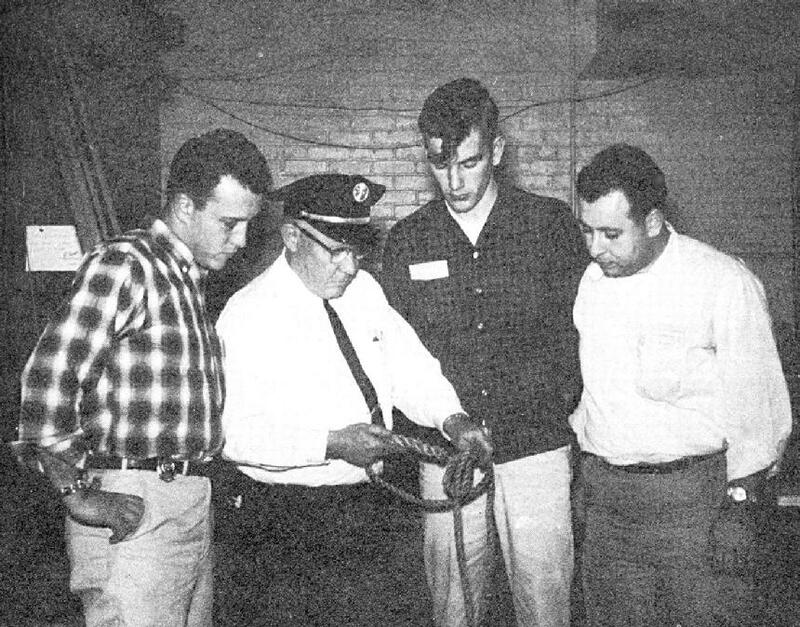 It is pictured here in 1970 with Firefighters Walt Macdowall and Dan Murphy at old Station 3 on Putnam Avenue. The high bid for the 1958 International was $180. Sadly, and ironically, this truck was totaled and the driver killed two years later in West Haven. When the new 1971 rescue went in service at Station 4, it was designated "Rescue 1" and covered the same territory as old Rescue 2. Engine 2 handled all rescue calls in the south end of Hamden until April 1976, when a new Rescue 2 was acquired with the assistance of the UNITAS Club of Hamden and assigned to Station 2. 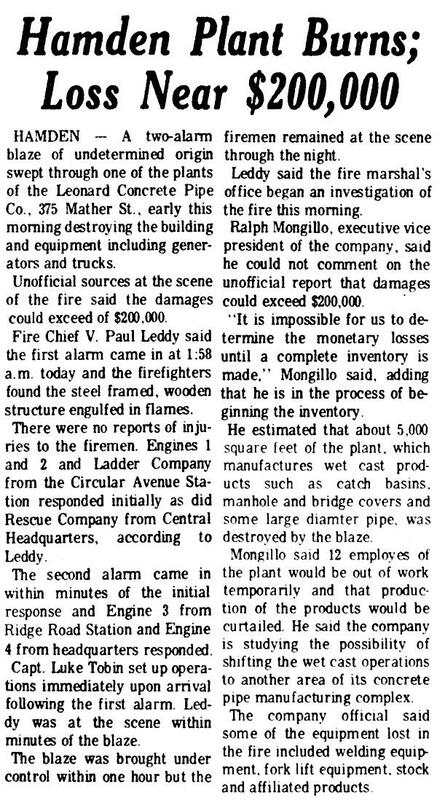 An early morning 2-alarm blaze at the Leonard Pipe Co. on Mather Street caused approximately $200,000 in damage and put 12 employees out of work temporarily. Engines 1 and 2, Truck 1, Rescue 1 and Car 30 (Dep. Chief shift commander) responded on the initial alarm. The second alarm brought Engine 3, Engine 4, Truck 2, and Car 40 (Chief) to the scene. The fire was under control within an hour, but firefighters were on scene throughout the night.